Are you looking for a natural moisturizer that doesn’t contain essential oils, fragrance, and unnecessary preservatives? I think I’ve found the perfect moisturizer for you! 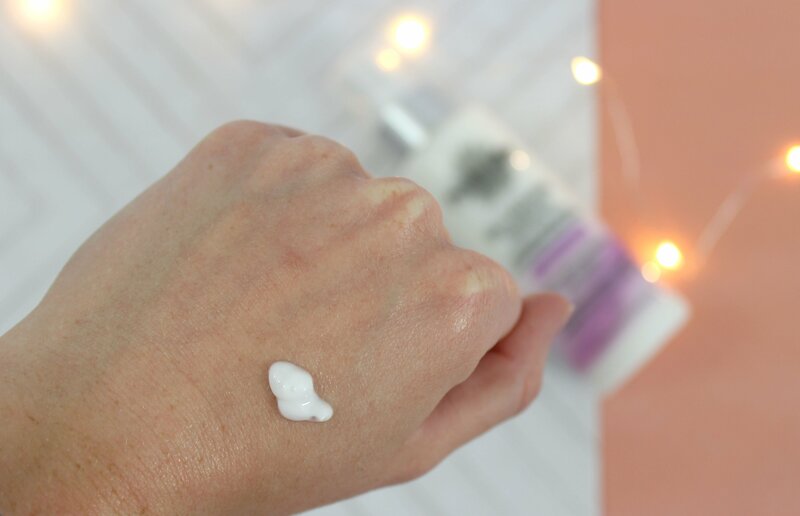 It’s the Penny Lane Ultra Hydrating Moisturizer and long story short – it’s my holy grail natural moisturizer! If you’re an avid reader of my website you may remember that I purchased the Penny Lane Ultra Hydrating Moisturizer a little while back from Well.ca. Since then I’ve been using it daily and I have fallen totally in love with it. Penny Lane Organics hails from Meaford Ontario, in Canada. They have a personal philosophy that if they will not put it in their body, they will not put it on their body. Of their wide range of products the most complex product has only ten different ingredients. Pretty darn good if you ask me. This moisturizer is described as a rich yet light and made with plant-based oils and butter to hydrate and moisturize your skin. And it does. A little bit goes a long way with this moisturizer! You don’t need a full pump for your face (+10 points for the fact that it has a pump!) I generally stick to half a pump of product. When you spread it on your skin it doesn’t take forever to sink in and it doesn’t leave your skin feeling sticky either. It works best for dry-normal skin types; during this dry weather I have not had a single dry patch of skin since I began using this (and our weather is fluctuating like crazy!) However, in the summer this could be too heavy for someone with normal skin… unfortunately I will not know until I am able to test it out. As stated earlier, this bottle of lotion has a pump! Thank goodness. It’s so much more hygienic than scooping face lotion out of a jar. As well, with this product you get 200 ml (6.7 oz) in a bottle. When you compare the Vichy Aqualia Thermale Extra Sensitive 50 ml (1.7 oz) which costs $39.95 CAD you’re paying almost $23.00 for 1 oz of product. Whereas, the Penny Lane moisturizer you’re paying $4.00 CAD per 1 oz. It took me almost 3 months to get through the 1.7 oz of Vichy Aqualia Thermale moisturizer. So I can see this Penny Lane Moisturizer lasting me almost a full year! The first ingredient, Almond oil is often said to be one of the best oils for clear skin. There are two types of almond oil (I don’t know which one this is.) But they are packed full of nutrients that will moisturize skin and make it feel super soft. Apricot Kernel Oil acts as an antioxidant, emollient (moisturizing), anti-aging ingredient and also has anti-bacterial properties. It quickly absorbs into the skin without leaving it feeling oily and it is safe for people who have sensitive skin. Aloe Vera provides soothing and moisturizing properties (which is why it is often used on sunburns!) Aloe Vera also helps treat acne-prone skin as it has natural anti-inflammatory properties as well. Vitamin E is known to block skin from free radical damage which can help prevent signs of aging. It is also packed full of anti-oxidants. Geogard Ultra is another EcoCert preservative which is composed of a blend of natural ingredients. I would like to research this ingredient more in-depth. Why is the Penny Lane Organics Ultra Hydrating Moisturizer the BEST Natural Moisturizer? I am in awe at this product. To be entirely honest I didn’t think I would find a natural moisturizer that actually worked this well. As I said before, it has completely mitigated my dry skin. For the past couple weeks I’ve had a horrible cold (one where you need to stick tissues up your nose for a break!) Usually this frequent nose-blowing routine would lead to the skin above my upper lip becoming raw and dry. I have not had a single dry patch of skin on my face after using this product. I must admit though, I have been using the Indie Lee Squalane Oil at night too. The Indie Lee Squalane oil has nothing but good reviews so I caved and purchased it as well (as I didn’t expect to find a great moisturizer right off the bat!) The Squalane oil definitely does help to moisturize my skin. I don’t know whether my skin has been so moisturized due to the Squalane Oil, this moisturizer or a combination of the two. I’m sure the combination has certainly helped. Even if this moisturizer by itself is not what has been keeping my skin so soft during this dry winter I do think that it is a great product because it doesn’t leave your skin feeling oily, sticky or gross. Just soft. Which is something I have noticed in the mornings after applying only this one product. One hundred percent! Without a doubt. I think this is a total winner and if you’re on the hunt for the best natural moisturizer, don’t look any further! The Penny Lane Organics Moisturizer is available from Well.ca (make sure to use ebates with Well.ca purchases!) Or directly from the Penny Lane Organics website. What is your holy grail moisturizer?